Surrounded by pristine forests and well-kept fruit orchards, the Echo Canyon Spa Resort is an award-winning spa hotel that offers an elegant and tranquil retreat getaway in the heart of Sulphur, OK. The boutique resort features deluxe accommodations, ranging from charming manor suites to cozy cottages with Jacuzzi tubs and private decks, luxury amenities, and facilities such as an exclusive spa and wellness center, an outdoor swimming pool and an upscale restaurant that serves a creative menu of prime meat and seafood. 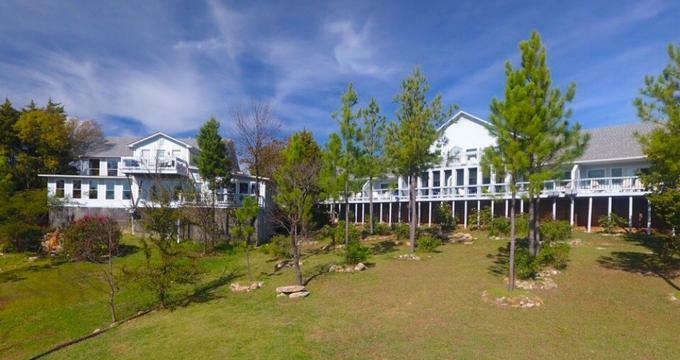 The Echo Canyon Spa Resort is well-placed for exploring the area and is just a few miles from the Chickasaw Cultural Center and Turner Falls Park. The Echo Canyon Spa Resort features a variety of deluxe accommodations, ranging from elegant mansion and manor suites to secluded cottages and opulent suites in the Carriage House. The Mansion features eight beautifully appointed suites and retreats with luxurious décor and period furnishings, comfortable beds, en-suite bathrooms, and private porches with beautiful views. The Manor House has two charming suites with similar amenities, along with sitting rooms with sofas and armchairs and both the Mansion and Manor House have elegant communal rooms with plush furnishings and fieldstone fireplaces where guests can relax. The Manor House also has a covered eight-person Jacuzzi hot tub with robes and Jacuzzi towels. Suites in the Mansion and the Manor House feature king or queen-size beds with signature Chiro-dreamer sleep-tronic mattresses, deluxe linens and hypoallergenic pillows, and en-suite bathrooms with walk-in showers, mood-lit Jacuzzi mineral baths or double Jacuzzi tubs, plush towels and bathrobes, and designer toiletries. In-room conveniences in each room include mini-fridges, coffee makers, microwaves, televisions with satellite channels, and complimentary wireless Internet. Overlooking Wilson Creek and thick woodlands, Hidden Creek Cottage feature a king-size bed with a signature Chiro-dreamer sleep-tronic mattress, deluxe linens and hypoallergenic pillows, and en-suite bathroom with a walk-in shower, plush towels and bathrobes, and designer toiletries. A sunny sitting area has a large leather couch, a double Jacuzzi hot tub, a wet bar, microwave, fridge and television with cable channels. Situated at the bottom of a pretty blackberry vineyard, Lady Jane’s Cottage features an ornate king-size bed with a signature Chiro-dreamer sleep-tronic mattress, deluxe linens and hypoallergenic pillows, and en-suite bathroom with a walk-in shower, plush towels and bathrobes, and designer toiletries. The cottage has a large flat screen television with cable channels, a reclining leather couch and a wet bar area with a fridge and microwave and opens onto a private courtyard with rocking chairs and a carport. The Carriage House has two elegant suites which offer comfortable king-size beds with signature Chiro-dreamer sleep-tronic mattresses, deluxe linens and hypoallergenic pillows, and en-suite bathrooms with walk-in showers, plush towels and bathrobes, and designer toiletries. In-room conveniences in each room include jetted Jacuzzi tubs, mini-fridges, coffee makers, microwaves, televisions with satellite channels, and complimentary wireless Internet. Suites have private patios with rocking chairs. Guests are treated to a gourmet breakfast every morning and can enjoy award-winning cuisine at the Baron of Beef Restaurant in the evening. The restaurant serves a creative menu of prime meat and seafood dishes, prepared with high quality, locally sourced ingredients and herbs from the Inn’s gardens. Guests can relax over a candlelit four-course dinner and soak up the magnificent views over the Echo Canyon. The Echo Canyon Spa Resort offers an array of amenities and facilities, including an outdoor swimming pool and sundeck, beautifully manicured gardens, a full service 5,000 square foot spa and wellness center, and an award-winning restaurant. A gourmet breakfast is served every morning, and in-room amenities include mini-fridges, coffee makers, microwaves, televisions with satellite channels, and complimentary wireless Internet. Additional concierge services include rose petals, sparkling non-alcoholic beverages, Champagne or red and white wine, long-stemmed roses, seasonal flowers, and chocolate-covered strawberries. The award-winning, island-inspired Aloha Spa offers an array of indulgent and pampering treatments in an elegant and tranquil setting. The Spa features a chic lounge and bar area, stylishly appointed treatment rooms designed for relaxation and meditation, and presents a menu of more than 100 rejuvenating treatments, massages, facials, and salon services.